When it comes to prime lenses for the Fujifilm X-series, there is a wide range to chose from, ranging all the way from ultra-wide to medium telephoto. In the Fuji family, prime lenses come in two flavors: a "higher-end" f/1.2-1.4 series and a more affordable f/2 series. That said, both aperture "flavors" are still classified as Fuji's top-tier XF-series of lenses, so despite the slightly slower aperture, these more budget-friendly f/2 primes don't skimp out on features or performance. The most recent addition to the f/2 XF primes is the XF 50mm f/2 R WR lens, which fills a noticeable focal length gap in the f/2 lineup, sliding in between the 35mm f/2 and 90mm f/2 macro lenses. The lens is also nicely compact, weather-sealed and is priced at a reasonable $450 -- half of what the pricer 56mm f/1.2 lens costs. Given the quality of Fujifilm lenses, it's no surprise that this one also performs spectacularly when it comes to sharpness. Wide open, the 50mm f/2 offers exceptionally sharp results in the center with only the slightest hint of corner softness by comparison. Stopping down a bit will sharpen things up across the frame. We measured optimal sharpness, with practically flat sharpness graph, at f/5.6. Past f/5.6, image quality remains very sharp, although we do begin to measure a slight dip in sharpness as you continue to stop down. At f/11, sharpness is still very good, while diffraction-related softness becomes more noticeable at the narrowest aperture of f/16. The Fuji 50mm f/2 displays extremely low chromatic aberration. Based on our measurements, the amount of CA we observed hovers right around the zero mark. Even while looking at test images, in the corners, we see little to no visible aberration at all. Like CA, vignetting is very well controlled on the Fuji 50mm f/2 lens. It's not entirely devoid of vignetting, as we see minor corner shading at the wider apertures; a hint above 0.25EVs of falloff at f/2. As expected, vignetting decreases as you stop down, remaining well under 0.25EVs of corner shading at f/5.6 and beyond. Distortion is extremely low for this 75mm-eq. portrait lens. On average, we measure distortion at just a hint above the 0% mark. In the corners, our testing measured an ever-so-slight amount of pincushion distortion, but it would be challenging to see in real-world images. The Fuji 50mm f/2 uses an internal-focusing system powered by a stepper motor drive mechanism, which results in generally fast and silent AF performance. Most of the time the AF speeds are very quick. Small focus adjustments are extremely quick and focusing from minimum focus to infinity takes around half a second. Overall, AF performance is excellent, although we did observe some slowdown at close-focusing distances. Manual focus is available as well, though due to the focus-by-wire system, it works differently than a mechanical-driven focusing system. The focus ring is buttery smooth to rotate, without any hard or soft stops at either end of the focus range. The amount of rotation necessary to rack through the focusing range varies depending on how quickly you rotate the electronically-controlled focus ring, but the lens, nevertheless, requires a lot of rotation to go from one end to the other. However, it does make it easy to have fine-grained focus control. This lens is not designed for macro photography, offering only a 0.15x magnification factor (1:6.7 ratio). With a minimum focusing distance of 39cm (15.4 in. ), the lens isn't the best for general close-up photography, either. Despite the affordable price point, the Fuji 50mm f/2 is built really well. Featuring robust, metal construction as well as robust weather-sealing (it's dust, moisture and freezeproof down to -14 F/-10 C), the lens offers top-notch build quality all in a rather compact package. While solidly built, the lens is very compact and lightweight, weighing only 200g (0.44 pounds) and measuring just around 60mm long and 60mm in diameter (2.34 inches). The front filter thread sizing is only 46mm. Given its overall compact size and minimal weight, the lens balances well on any Fuji X Series model, both big and small. Like most other Fuji X-Series lenses, the 50mm f/2 features a manual aperture control ring placed close to the base of the lens. The aperture ring offers marked whole-stop increments from f/2 to f/16, although there are tactile third-stop increments throughout. Past the f/16 mark, there's an "A" (auto) setting that, in a sense, deactivate the aperture ring and lets you dial-in the aperture using camera body controls. The lens also features a small, approximately half-inch-wide focusing ring. Like most mirrorless lenses, the Fuji 50mm f/2 is an electronically-focused lens, which means the focusing ring turns forever in either direction. There are no hard or soft stops to indicate minimum and infinity focus, nor are there any kind of focusing distance scale or DOF markings. The lens also doesn't have a dedicated AF/MF toggle switch -- manual focusing with this lens is heavily reliant on the camera body. 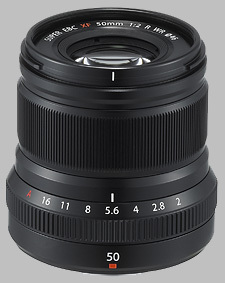 As for the optical layout, the Fuji 50mm f/2 WR lens features nine total elements, including one aspherical ED (extra-low dispersion) element, placed into seven groups. The lens features Fuji's Super EBC (Super Electron Beam Coating), which help reduce flare and ghosting. The lens features a 9-bladed rounded aperture diaphragm, which helps make pleasingly smooth background blur or bokeh. Interestingly, although there are lots of lenses for the Fujifilm X Series, there isn't another 50mm lens from Fuji themselves. There are a few alternatives, though, if you want a lens that's around 50mm (75mm eq.) for your Fuji camera. The most direct competitor, if you want another Fujifilm option, would be the XF 56mm f/1.2 R. This pricier portrait lens offers a slightly longer focal length but more notably, a super bright f/1.2 aperture. Sharpness at f/1.2 is excellent, but both it and the 50mm f/2 offer similar sharpness at f/2. At $900, the 56mm f/1.2 is twice the price of the 50mm f/2 and doesn't even offer weather-sealing, but if you need better subject isolation and low-light performance, the f/1.2 lens is definitely tempting. The other option for a prime lens alternative is the Zeiss Touit 50mm f/2.8 Macro lens, which comes in both Fuji X-Mount and Sony E-Mount. This lens provides the same 75mm-eq. focal length as well as autofocus functionality (something that not all Zeiss lenses offer). However, seeing as it's a macro lens, the close-focusing distance is significantly better than that of the Fuji 50mm f/2 -- the Zeiss offers 1:1 magnification. The Zeiss' aperture isn't as bright, so you lose some light-gathering capabilities, and, at $1000, it's also more expensive than both the 50mm f/2 and 56mm f/1.2. We've yet to lab-test this lens, but customer reviews are positive, praising its image quality performance. If you want an AF-capable, portrait-friendly 50mm lens for your Fuji camera that also has true macro features, the Zeiss Touit 50mm f/2.8 Macro is worth a look. Overall, the Fujifilm 50mm f/2 WR lens is an excellent little offering. It fills a notable gap in Fuji's lens lineup, more or less filling the role as the X-series' "nifty fifty" prime. It's not as affordable as other "nifty fifties" on the market, some of which dip in price below $200. But, what you get here for the money is still an amazing value: stunning image quality, even wide open; excellent weather-sealed build quality; and a really compact, lightweight lens despite its large APS-C format. If you don't need, or want, the larger, heavier, more expensive Fuji 56mm f/1.2, the 50mm f/2 is a solid winner. The Fujinon XF 50mm f/2 R WR doesn't have any user reviews yet!